Chockstone has been a bit sad lately, so I thought I'd post a little ditty about wot I got up to last weekend. If you're after epics and/or big numbers, stop reading now - I'm too old and tired for that shlt. Some friends of ours had access to a house in Truckee (north of Lake Tahoe) for the weekend, and invited 2 other families up for a genteel weekend of bike riding, swimming, drinking moderate amounts of overpriced wine, and all the usual stuff that old & enchildrened people are reduced to. Knowing that one of the other dads (let's call him Paul, since that's his name) was (as in, used to be) a climber, I snuck my gear into the car and started quietly prepping the kids to lobby for a day's climbing. Initially I thought my cunning plan had failed, since Saturday turned into a day of bike riding with the kids, though we found a lovely new paved trail that heads east out of town down the Truckee River, and managed to cajole and bribe the horde into riding about 25km, which was pretty great. 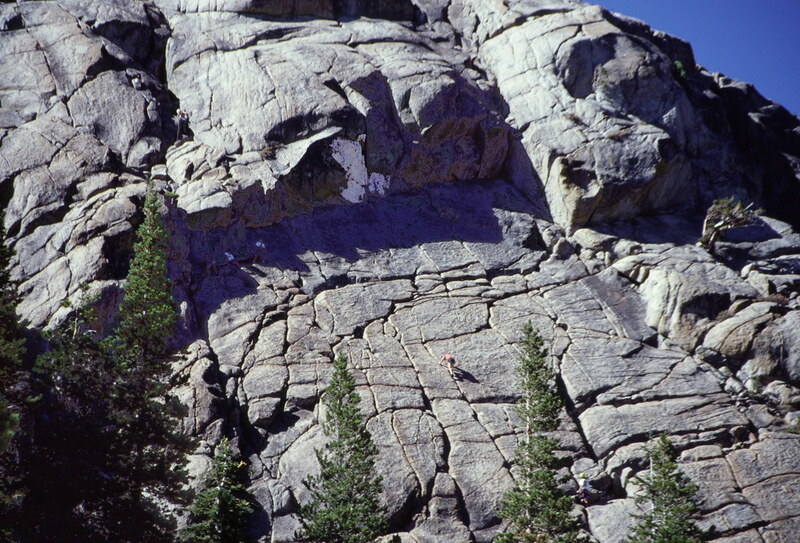 Luckily that night the kids perked up and started saying they wanted to do some climbing, and I managed to persuade all 3 kids (my 2 plus Paul's) to lobby Paul to jump on a multipitch cruise on School Rock, up at Donner Pass. I was pretty happy with this, given that Paul's kid had never been on a multipitch before, and my two were still smarting from an epic we'd had 2 years before, which ended in us bailing off Lembert Dome in Tuolumne Meadows in a rather scary and very wet electrical storm. Paul was dubious that climbing in a gaggle of 5 was going to work, but somehow I managed to convince him it'd be fine, and a plan was hatched. Our goal was the easiest route on the main rock - a 2-pitch 5.3 (~grade 6) called Kindergarten Slab on the left hand end of the main face - but having previously soloed halfway up some of the "harder" routes to the right, and knowing that pretty much the entire wall is climbable at an easy grade, I "accidentally" got a bit off route and ended up on the 5.5 (~grade 10) next door. I chose to keep pitch 2 short, since I knew the overlap would be the crux for the kids (not hard, but a bit reachy for the kids and quite exposed now that we were 50+m off the deck) - I belayed just below where the guy above the overlap in that photo is, on a lovely sunny ledge. Up until that point we'd simulclimbed all 4 "seconds" (Paul + the 3 kids), but for this pitch the kids basically came up in pairs (one rope at a time) - we'd spaced them about 5m apart on the ropes, and the crux was only about that long, so it worked out pretty well. The kids romped up it, but then started bonking, so we quickly ate the picnic lunch we'd brought and cruised down the easy 20 minute descent back to the base. All in all an AWESOME day out - while the easy grades and glacial pace barely whetted my appetite for "real" climbing, being able to cruise up bomber, sunny, featured granite with a bunch of (mostly) happy kids and a mate was just fantastic. And now that the kids are a bit familiar with the dome, I don't think it'll take much to get them on some of the slightly harder & longer routes further right again. Great stuff ... um ... "bonking"? >Great stuff ... um ... "bonking"? Yeh an voyerizm2, as they ate their picnic lunch while watching? Awsum ped umm estrian report pm! Sorry - seppoism for hitting the wall. Nice one Peter - always good to get a sly climbing day out of a family outing :-) Cool pics - you are living in a great part of the world for climbing. I remember your Lembert Dome story - brave man for wrangling 5 on 2 ropes on multipitch - I'm increasingly wrangling a couple myself, but have been sticking to single pitch to date - can't wait for my boys to be able to belay me. >Yeh an voyerizm2, as they ate their picnic lunch while watching? >Awsum ped umm estrian report pm! >Cool pics - you are living in a great part of the world for climbing. None of those photos are mine, but yes the Sierra are AWESOME!! Oh I've been "wrangling the rope" since well before I took up climbing - I'm pretty good at it, if I say so myself! It sounds to me that that could be a recipe with potential for epic-ing, (not withstanding that you have solo-ed harder stuff there). Do you use a Guide/Reverso style device, or an ATC/Sticht style device in that situation? Well only the 4 "seconds" simulclimbed - the leader (me) was just doing a standard double rope lead. >(not withstanding that you have solo-ed harder stuff there). Yeah - the worst case scenario I can think of is if all 4 seconds fall off at around the same time (or knock each other off - same net result), resulting in the leader having to hold ~150kg of seconds distributed reasonably evenly across two ropes. But this route was very slabby, so it wouldn't be a free hang on the rope. I'd be pretty nervous about doing this on anything much harder, or on vertical or overhanging terrain. I use a Guide, although the first time I did this I was still using an ATC. With the skinnier ropes (this was my first climb with my brand new 8.5mm Mammut Genesis doubles - mmmmmm....sooooo gooooood) I'd probably be a bit leery of belaying with an ATC. In fact the first time I used this technique we used two 10.5mm ropes (as heavy doubles), so even with the ATC it was probably about the same?